Prince William County Real Estate offers an exceptional combination of modern conveniences, home town traditions and historical treasures. Located just 35 miles from our nation’s capital, Prince William County Real Estate proudly shares with resident’s visitors the best known Civil War site in the area, Manassas National Battlefield Park. It's a fantastic destination for hiking and exploring the entire year through. 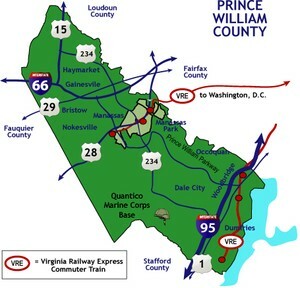 The Virginia Railway Express (VRE) transports thousands of Prince William County Real Estate Residents to and from D.C. annually. In addition there are many Slug Lines to aid daily commuters. A 56 million dollar performing Arts Center is under construction and is a cooperative project of George Mason University, Manassas City and Prince William County. The complex features a stunning 1,100 seat performance hall which is styled after 19th century European Opera Houses. Prince William County real estate is some of the most affordable real estate in the entire D.C. metropolitan area, making it a popular relocation destination for home buyers. Because of the region's close proximity to our nation’s capital, real estate in Northern Virginia is substantially higher than most other areas of the country. Prince William County real estate, however, is priced more affordably than most areas in Northern Virginia - offering homes within commuting distance to the District of Columbia at a price that's much easier to swallow. As realtors, our main area of expertise is Prince William County real estate. So you can rest assured if you're focus is homes for sale in Manassas, Haymarket homes for sale, real estate in Gainesville or Woodbridge homes for sale -- we've got you covered. Let us know if you are planning to move to Prince William County as we would be thrilled to assist you!